They say a dose of disappointment makes one stronger. 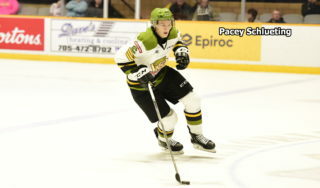 North Bay Battalion defenceman Brady Lyle has identified with that old adage over the course of the summer, one that included the longest day of his life. 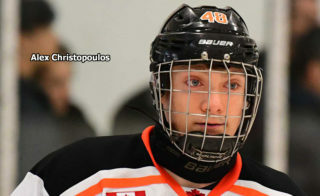 Ranked 53rd among North American skaters on NHL Central Scouting’s Final Rankings ahead of the 2017 NHL Draft in Chicago, Lyle and his family weighed the options and decided to make the trek to the Windy City. 500 miles, two days and seven rounds later, Lyle, along with a smattering of other disappointed prospects, returned home without hearing their names called. At a crossroads, Lyle didn’t spend a lot of time dwelling on the experience, opting rather to use it as a springboard to something bigger as he got busy preparing for his third OHL season in his hometown of North Bay. The 6-foot-1, 196Ib. 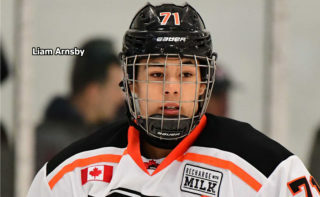 right-shot defenceman was originally a first round (18th overall) pick of the Battalion in the 2015 OHL Priority Selection out of Shattuck-St. Mary’s Prep., a private school in Faribault, Minn. that is best known for developing NHL star Sidney Crosby. 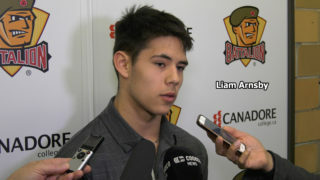 Lyle overcame a broken collarbone in the pre-season of his rookie campaign with the Troops before recording 10 points (1-9–10) in 44 games. He made progress this past season, putting up 25 points (4-21–25) in 58 contests. Though hockey, like anything in life, presents its share of obstacles, there are folks along the way who can identify with the struggle, those who have walked through similar situations in their own lives. Fortunately for Lyle, one such person hangs out just down the hallway at North Bay Memorial Gardens. “It fuels you, I missed the draft twice and didn’t get picked until I was 19,” said Battalion assistant coach and former Mastercard Memorial Cup champion Adam Dennis. “I hope Brady turns this into the best thing that ever happened to him. Lyle’s deep roots in North Bay have made him a valued member of the team in the community. He enjoys interacting with kids at minor hockey practices in the city and is able to live at home with his family throughout the season. His father Dave owns and operates The Abbey Cards & Gifts, a long-standing business in downtown North Bay. 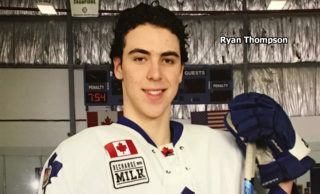 A smooth-skating, puck-moving defenceman, Lyle grew up admiring OHL players Dylan Staples and Danny Desrochers as a young player in North Bay. North Bay fans, often referred to as the ‘seventh man’, are likely to see more of their hometown product this season as he takes on more responsibility alongside established defenders in Arizona Coyotes prospect Cam Dineen, Swedish sophomore Adam Thilander and a trio of overage possibilities in captain Riley Bruce, Zach Shankar and Jesse Saban. It should be mentioned that Lyle’s summer wasn’t totally shrouded in disappointment. 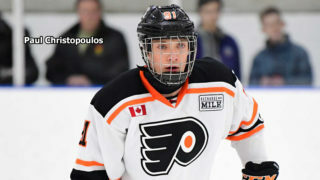 An invitation to Development Camp with the Anaheim Ducks as a free agent invitee provided a silver lining and something that left quite an impression on him. Ironically enough, Lyle’s exit meeting was with Ducks Director of Player Development Todd Marchant, a former 16-year NHL veteran who wasn’t drafted until he was almost 20 years-old. “It really gave me some perspective,” he noted. “We talked about guys who got passed over but still ended up being successful NHL players because of hard work and determination, guys like Martin St. Louis.